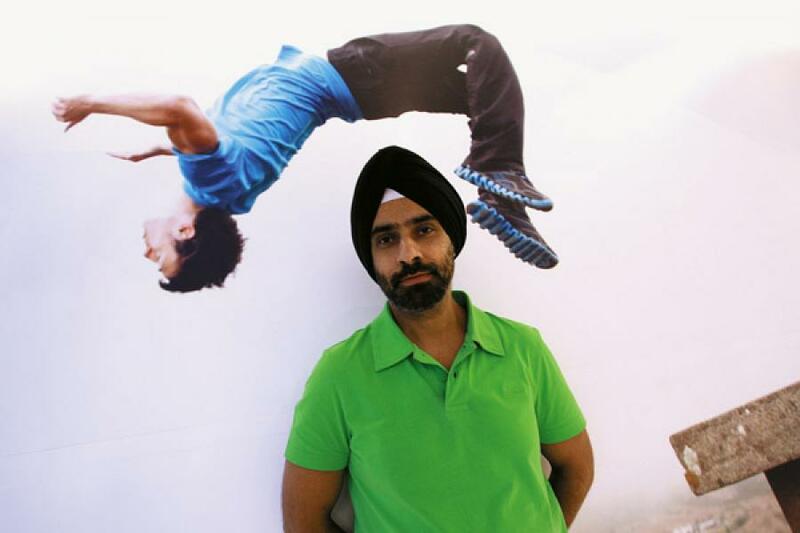 Adidas sacked its India CEO Subhinder Singh Prem for disobeying orders. But was Prem really out of line? “We’re not getting along and it’s better you leave amicably.” With those words Subhinder Singh Prem’s 17-year career at Reebok came to a hard stop. It was late March and Prem, 44, the former managing director of Reebok’s Indian entity was in Phoenix, Arizona, for a bi-annual meeting to present the company’s business plan for the fast-growing Indian market. Reebok’s India businesses were to be downsized in 2012 and, though there were differences between Prem and his boss Ronald Auschel on how swift the downsizing should be, Prem believed he’d managed to do the balancing act needed to stay at the helm. Instead, he was asked to summarily step aside. A month later, on April 30, in an earnings release, Adidas would announce exceptional sales and profits in its global operations. Those results were overshadowed by what the company termed as ‘commercial irregularities’ in its Indian operations. It said the company would be taking a euro 125 million write-off and restating its results for the year 2010. It asked investors to brace for a further euro 70 million write-off. A week later, the company filed a criminal complaint against Prem. Prem hit back with two cases—one for defamation and another for recovery of his past dues amounting to Rs 12.7 crore in the Delhi High Court. The Delhi High Court is expected to hear the cases in July. Unless both parties eventually arrive at an out-of-court settlement, there’s every chance that the last has not been heard on this rather unexpected high-voltage drama inside the world’s second largest sports shoemaker. So what really led to a sudden escalation of hostilities between the swashbuckling go-getting Indian executive and a highly conservative German multinational? Was it merely a clash of corporate cultures, given that Prem belonged to the erstwhile Reebok set-up which Adidas bought out in 2005? Or was he penalised for repeatedly questioning the Adidas system which prided itself on conformity and discipline? Before we delve into the answers, let’s first start at the beginning. Reebok’s rise in India reads like a fairytale success story. Globally, the brand ranks a distant fourth after Nike, Adidas and Puma, but in India it had built up an impressive network of over a 1,000 stores by 2012 and is the market leader. As Prem explains in an interview with Forbes India, “The reason why we grew was that yes we were looking at distribution. We believed in the spirit of the Indian market. We were in 325 cities. We had over a 1,000 stores.” In pursuing this aggressive expansion, he says he had the support of global headquarters and Reebok had innovated with products, price points and distribution all of which resulted in making it the largest sportswear brand in India with sales of about Rs 700 crore. When Reebok opened its first store in Delhi in 1996, under the leadership of Mukhtesh Pant, it took a leaf out of a concept pioneered by Benetton in India: It promised a minimum guarantee to its franchisee. “The whole idea of a minimum guarantee is that the company is convinced that the retailer will make money, but the retailer is not convinced,” says Harminder Sahni, managing director, Wazir Advisors. Since then, the concept of a minimum guarantee has become an industry practice. So the moot question: Why did Prem face so much flak for it from Adidas’ global HQ in Germany? It may have had to do with the fact that sports goods companies around the world follow an entirely different model: They rely on the wholesaler. The company sells its goods on a 44-45 percent margin to a wholesaler, who is then responsible for selling them. He could set up stores or could sell them to smaller franchisees, but the key point is that the wholesaler is responsible for anything that doesn’t sell. The rewards are his, but the risk is also his once the goods are off the company balance sheet. Globally, these wholesalers would decide when to plan stock clearances, how long to have the sale for, how much to discount goods and so on—all decisions that are typically taken by companies in India. Now in India, the situation was very different. With an underdeveloped retail market, Reebok realised that there were few wholesalers of repute that they could deal with. Remember Reebok was the first international sports goods company looking to set shop in India at a time when few Indians could afford to pay Rs 2,000 for a pair of shoes. Understandably, individual shop owners were also wary of buying expensive merchandise that may or may not sell. Their risk had to be balanced out. One way of doing this was to compensate them for their costs. In exchange, the company would balance their upside. So Reebok entered into deals with individual shop owners that took care of their rental and staff expenses. There were also instances when companies were forced to enter into minimum guarantee agreements at prime retail locations where the shop owners had the upper hand and could demand their pound of flesh. In return, the maximum profit these shops could make was capped at 30 percent. Reebok guided them on how to buy and sell, trained the staff and also planned the store fit-outs. It also supported them with strong promotional budgets. Industry watchers say that where Reebok slipped up was in selecting the right partners. Some shop owners had no interest in selling shoes and treated it purely as a financial investment that fetched a good return. In its aggression to expand in the marketplace, Reebok ended up opening too many outlets in areas that could only support one or at most two. Adidas too, relied partly on the minimum guarantee model to drive its distribution reach. And even after Adidas bought Reebok for $3.8 billion in 2005, both brands learned to live with this Indian reality. But things start to unravel by 2010. On November 8, 2010, Adidas announced a new gameplan to focus on profitable growth. Among sports goods makers, Adidas has been an underperformer. Its stock had lagged behind that of its main competitor Nike. In the five years from 2007, Nike’s share price has more than doubled to $104 while Adidas’ has risen 35 percent to $61. Inside its Herzogenaurach headquarters in Germany, Herbert Hainer, its global CEO, presented Route 2015, a comprehensive plan aimed at generating an 11 percent operating margin by 2015. Revenue would increase by 45-50 percent to euro 17 billion. The markets cheered. By the end of 2010, Adidas’ share price rose 29 percent outperforming a 16 percent rise in the DAX-30 Index at the Frankfurt Stock Exchange. The impact was felt in faraway India. Prem and his team at Reebok were asked to shut down unprofitable stores, slow down the pace of growth and chivvy up profitability. This news came as a huge dampener for the Reebok team whose mandate so far had been to focus on growth. Prem started working with Claus Heckerott, vice president, finance (global sales) on a downsizing plan. “We had some stores that made a lot of money, some were average and some lost money. The discussion was on how to cut the tail,” says Prem. And that’s where differences between the two arose. Adidas declined to reply to a detailed questionnaire. They also declined to elaborate on what they mean by commercial irregularities or to provide a copy of the criminal complaint. According to people familiar with the situation, the Reebok side favoured a gradual downsizing of stores. It argued that its existing relationships with retailers should be protected for some time. The Germans viewed it as a purely commercial transaction and did not see why they couldn’t shift to the wholesale model overnight. Prem acknowledges that their thinking wasn’t completely aligned, but says that there are 200 underperforming Adidas stores that are slated to be shut in 2013, a fact that the company has neglected to mention. Eventually, he believes it is this difference of opinion that may have done him in. For over six years after Adidas acquired Reebok, the two businesses in India operated as separate entities. The companies had very different operating styles and management reported to the US and Germany respectively. People who regularly interacted with Reebok say that its American culture was more aggressive, and bordering on brash. Adidas, on the other hand, operated in a more disciplined manner. Its employees went about scouting the market more methodically. When Adidas also started using the minimum guarantee approach about five years ago, its teams were forbidden from deviating from certain minimum parameters while negotiating these deals. Everything had to be approved by its headquarters in Gurgaon. At Reebok, the teams could make a business case for a store that would be approved later. This had its downsides because there were allegations that some employees took advantage of the system to indulge in corrupt practices. As a result, two things happened. Reebok grew rapidly. After losing money in its initial years in India, Reebok managed to wipe them out and closed its 2011 books with a profit of Rs 50 crore. It paid out about Rs 120 crore in royalty. Annual sales stood at about Rs 700 crore. Adidas, he says, has lost Rs 137 crore in the time it has been in India and sells roughly Rs 450 crore worth of shoes and merchandise every year. In May 2011, Prem was appointed the India managing director of the Reebok-Adidas combine. That’s when the cookie began to crumble. The business was hit on multiple fronts. A hike in excise duty on apparel, an increase in value added tax and a rupee that swung between 49 and 54 to the dollar increased costs by Rs 100 crore. 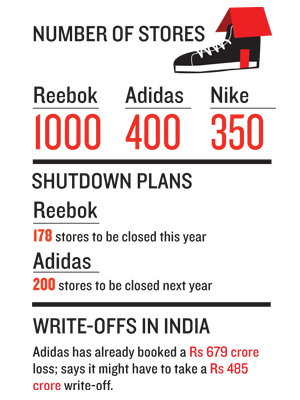 Sales declined and Reebok closed the year with Rs 650 crore in sales. The decline in the fortunes of the Indian operations was badly timed. Under Route 2015, Adidas AG began to push for more control over the Indian operations. While Prem was made managing director, they insisted that finance be headed by someone from within the Adidas fold. Shahin Padath was given the task of integrating the finances of the two businesses in India. It is unclear whether he approved last year’s financial statements. The company declined to provide a specific answer. Late last year, Adidas AG began to push for the appointment of Frederic Serrant as sales director. Prem resisted because he felt a local was better suited. 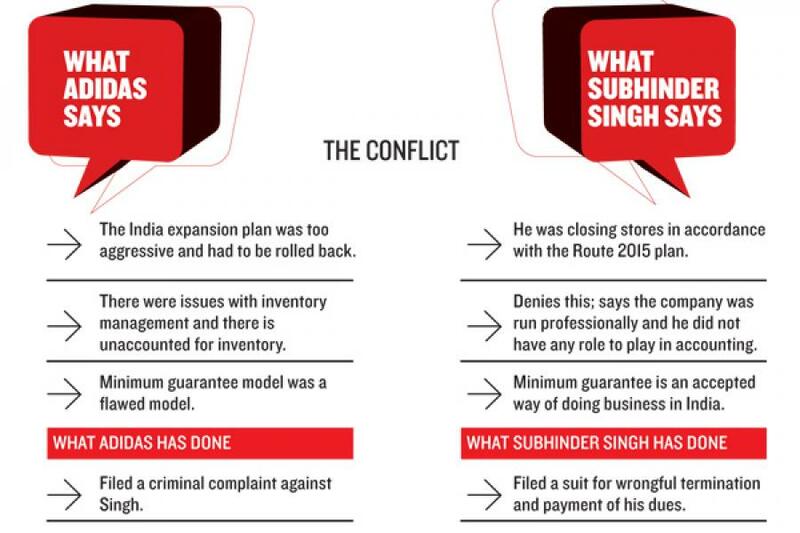 But his bosses in Germany decided to send Serrant to India to work on the Route 2015 project to downsize stores. Prem agrees that the company’s receivables were high, but says that all the stock was accounted for. This is probably the reason why Adidas was keen on downsizing Reebok’s operations more aggressively. When Prem refused he had to move on. On the evening of March 25, Prem completed his review and was told he should step aside so that Heckerott could take over. He agreed and boarded a plane to India the next day reaching Delhi on the 27th evening. On the 28th, he emailed his resignation. Prem says the next day he received an email saying Adidas was surprised he had resigned as he had been terminated for a reason. Thereafter, he sent two emails in April asking Adidas what the cause for his termination was only to be met with silence. Meanwhile, Adidas asked KPMG, its auditors in India, to conduct a forensic audit of its books. Their conclusion was unequivocal. There were commercial irregularities in Reebok’s side of the business that had to be dealt with. When contacted, KPMG declined to comment. Correction: Devangshu Dutta of Third Eyesight clarifies that he was not referring to Reebok in particular in his comment on channel stuffing. His comment was in reference to the industry in general. In this corporate world the success depends on good corporate Governance.There is purposefully a weak governance both from management at Reebok India Company at unit Level and Adidas AG at Head Office Level. The Headoffice was relaxed what was going on at unit level due to materiality and Unit was mismanaging the show to earn high compensation by inflating sales and managing funda at interest rates much higher than market. Funds were arranged from Ex. Solisitor General of India. This Hight of Mismanagement. God Save..The India Corporate world an ROC and MCA who blindly Register the Companies..
Looks like a paid article. Subinder Singh is a extra smart. Politician to the core. He is so fraudulent that he has shown huge sales of the company where there were no sales. And now by giving counter FIR in high court he is trying to use his journalist friends to show that he is honest person. That is all so LIE. Reebok books are all manipulated and thats what came to light when the Adidas chiefs look into it. RAJU from satyam and Subhinder from Reebok are just brothers like each other. Nothing will happen to them like this misleading readers. This article gave me the other picture. All this while I thought that these employees had committed a cheap fraud. Also interesting is the theory of Adidas having problem with Indians. I'll think twice before buying Adidas next time. Although good information, but very very badly written - how many places it is mentioned what eventually got him in? That's when the cookie began to crumble this difference of opinion that may have done him in. People familiar with the situation say what eventually did Prem in was the high receivables on the books. ----------------------------------------------------------------------------- Get a grip !! The larger question is what was Adidas global doing all this while when the alleged irregularity happened. What about the auditors who allowed such irregularity to happen and are pointing fingers at Shubinder now? Something does not appear to add up in the whole story being bandied about by Adidas Reebok combine now. Clearly there is more to truth than the oversimplistic posturing by Adidas. Adidas HQ has a lot to answer in this case and it is quite strange it is pretending to do otherwise. Impossible is nothing.